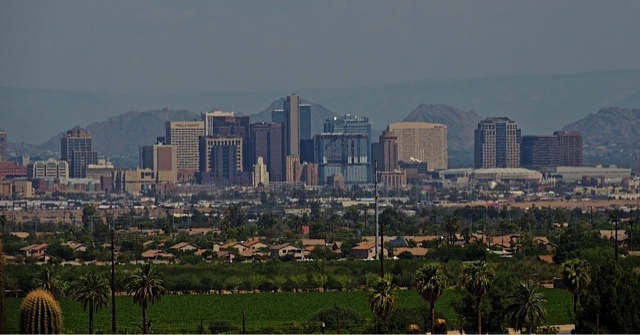 Pictures from Phoenix and sometimes from the surrounding cities that make up the "Valley of the Sun"
Sunday morning at Papago Park. 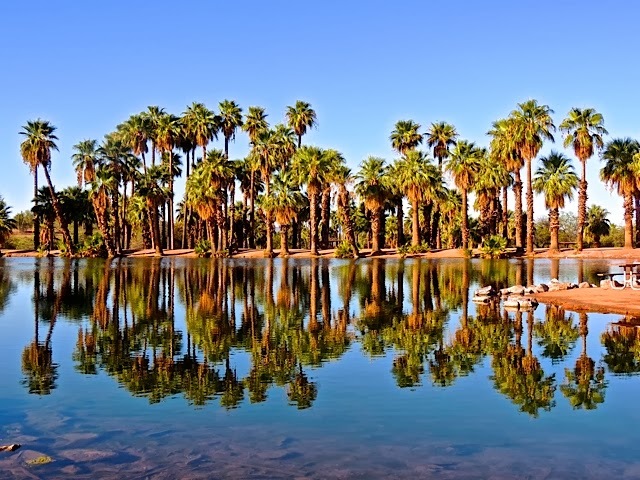 The lagoon was calm and it made a perfect setting for all those palm trees. I have a new photo up on Sharon's Sojourns today. I'm off to the theatre this time. 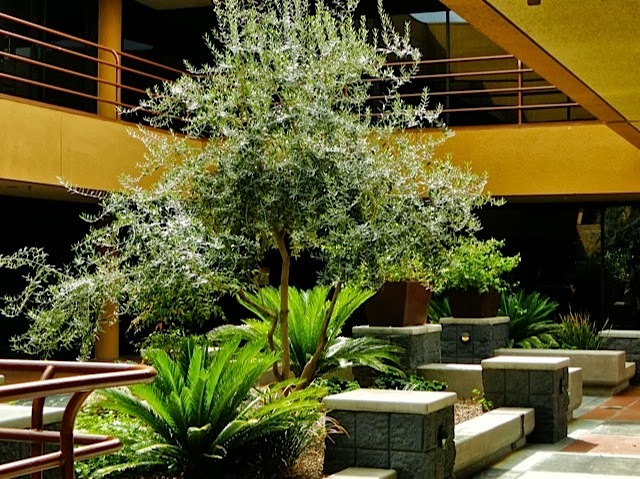 Here is another hidden office courtyard from the building I featured yesterday. This one really does look like a little oasis. 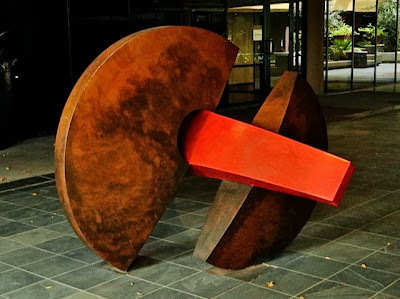 At the other end of this courtyard was this modern sculpture. I looked for an artists name but couldn't find one. One Sunday this summer I was driving around looking for photos when I decided to pull into a rather plain looking office building. I parked and started walking and I found a number of little oasis-like courtyards That were quite attractive, much more attractive than the street view. 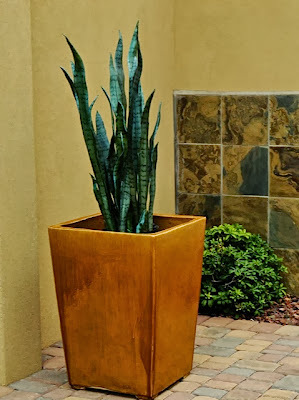 This was one of those courtyards and this planter was sitting next to an office door. Tomorrow I'll show you what I found in another courtyard. I happened to be in the right position at the right time to catch this reflection of the One Lexington condominium tower reflected in the 3300 Tower. Those windows look like mirrors in this shot. I spotted this sitting on a vacant lot near downtown. 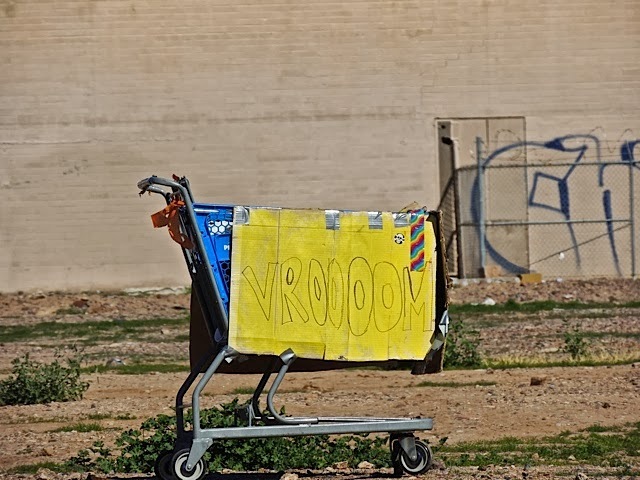 This must be a very speedy shopping cart. 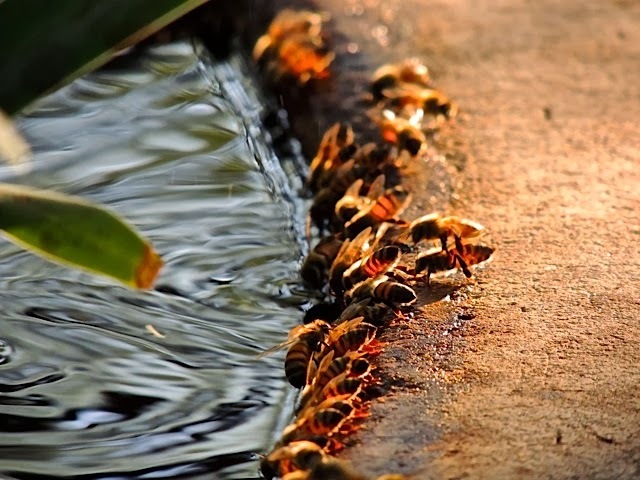 All the bees were lined up at the watering hole early Saturday morning. Extracting all the honey takes a lot out of you. I have a new post on Sharon's Sojourns. This time I visit a villa in Italy. 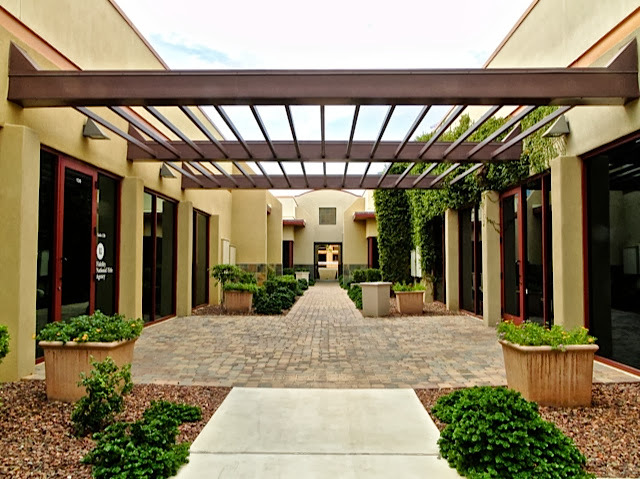 Last weekend was a busy, busy weekend with the symphony opening on Friday night, a benefit dinner for the Phoenix Public Libraries on Saturday and, Sunday night was the opening play in this season's Valley Broadway Series. 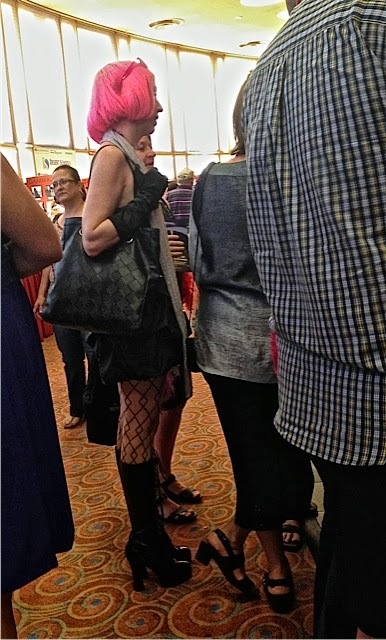 The play was "Priscilla Queen of the Desert" and as you can see from these photos, it prompted many audience members to dress for the occasion. 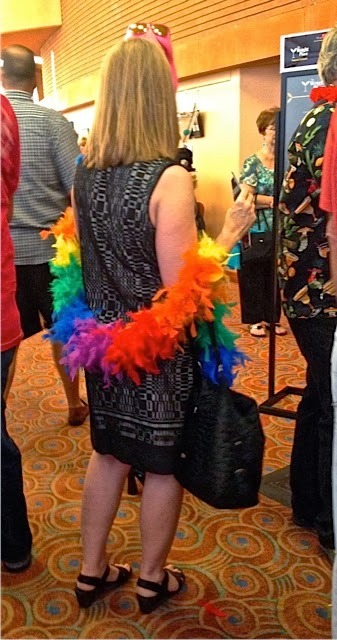 There were so many feather boas in the lobby that pink and yellow feathers were floating in the air. The production was fantastic, pure camp and exuberant entertainment. The excellent classic rock was brought to life with lots of glitter, sequins, wigs and glam. I highly recommend the show for pure foot stomping, hand clapping pleasure. 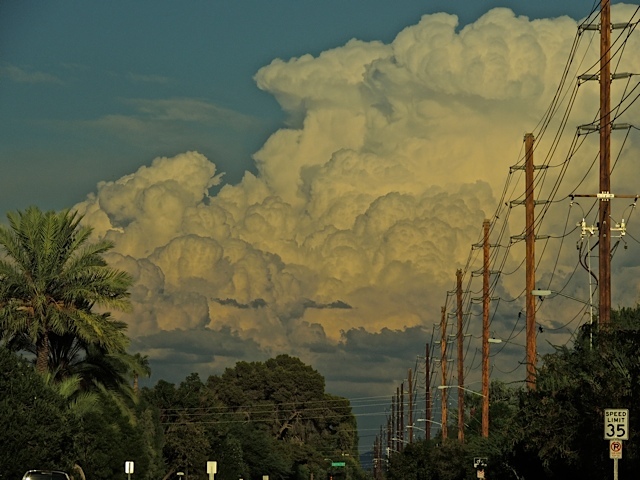 You might want to check out Scottsdale Daily Photo today. There might be some more fancy dress shots on that site. 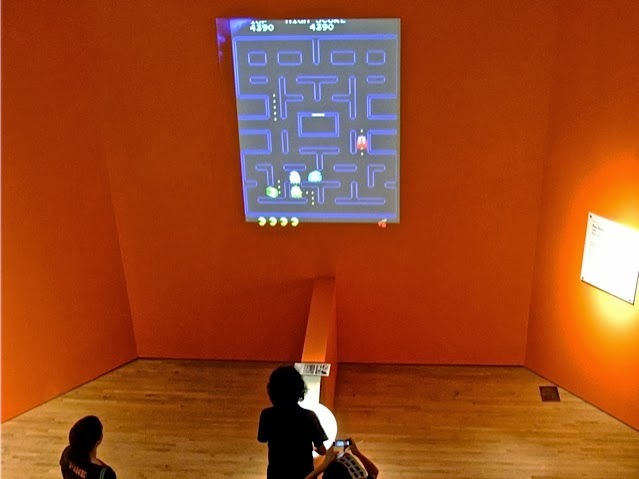 A good way to get a variety of young people into the art museum is to stage a temporary exhibit titled "The Art of Video Games". This exhibit is in its last week at the Phoenix Art Museum and it was drawing a large crowd on Sunday afternoon. 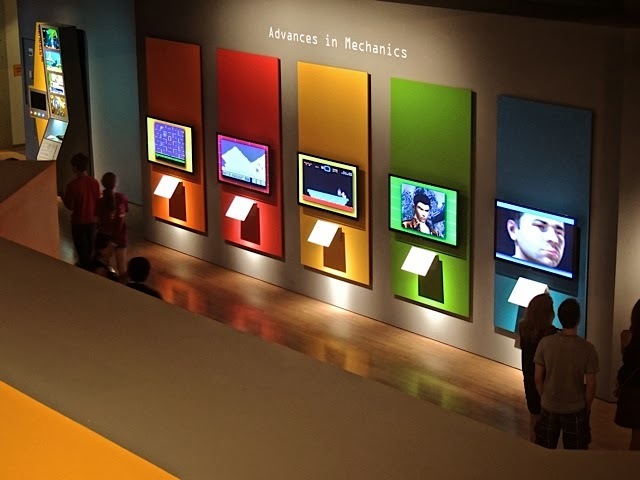 The display stations show the work of many of the top producers of video games and the history of game creation. The exhibit hall was full of glowing screens. 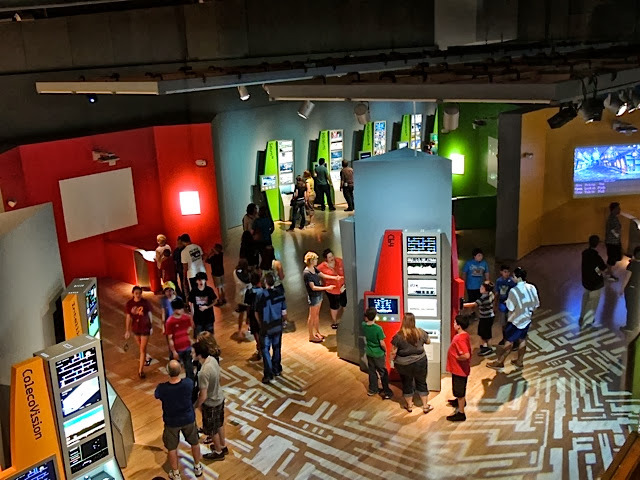 And there were lots of interactive stations where people could actually play a game. Here we have a lively game of PacMan going on. 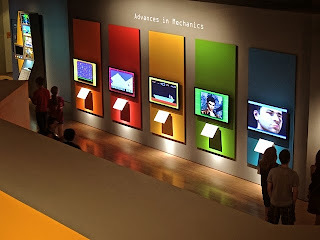 I'm not much of a video game player but I did enjoy roaming this room so full of bright colors and enthusiastic guests. It was even more enjoyable to see these same people taking in all the other exhibits in the museum. 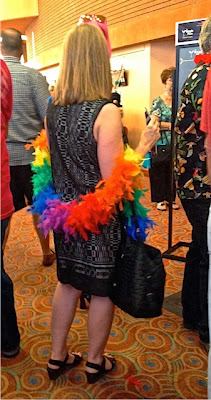 It was opening night at the Symphony last night and I accompanied Julie and Dave (Scottsdale Daily Photo & Tamarindo Costa Rica Daily Photo) to the event. Dave is on the board for the symphony so the event included a special reception before the performance. 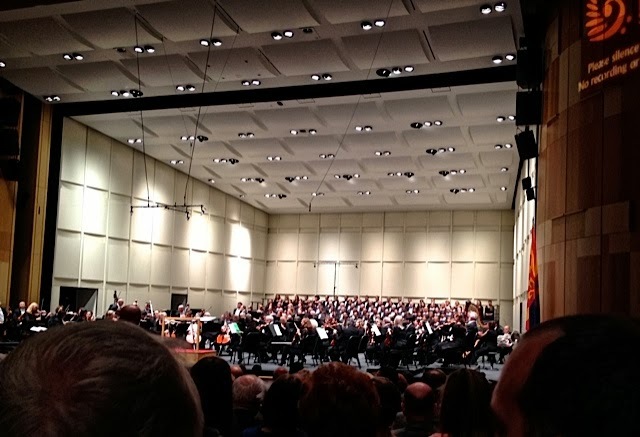 They did a spectacular job with Beethoven's Symphony No 9 with the very impressive help of the Phoenix Symphony Chorus. It was fantastic. So fantastic that it prompted at least an 8 minute standing ovation. I have a new post on Sharon's Sojourns. This time I reach back to 1986. About mid-week we started getting much cooler mornings so I took advantage of that today and went to the Botanical Garden for a walk. I met a gentleman whom I see taking pictures there all the time and we walked together. 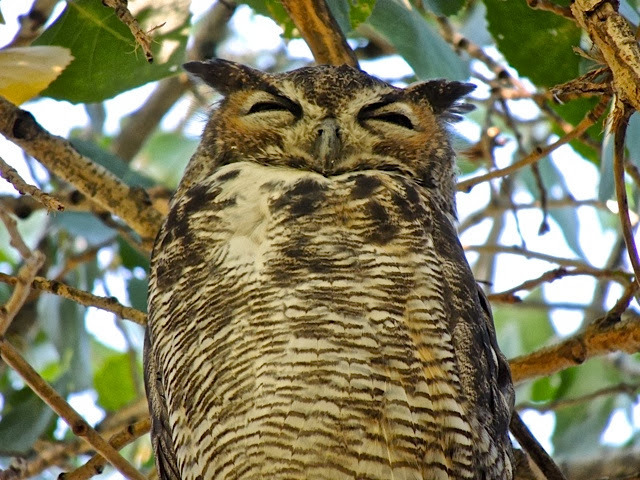 He has an amazing knowledge of all the wildlife at the garden and he showed me a spot where these owls hang out. It's away from where there is heavy traffic on the paths so that they can sleep and rest up for a night of hunting. This guy was not interested in a portrait. He just kept on snoozing as we snapped away. 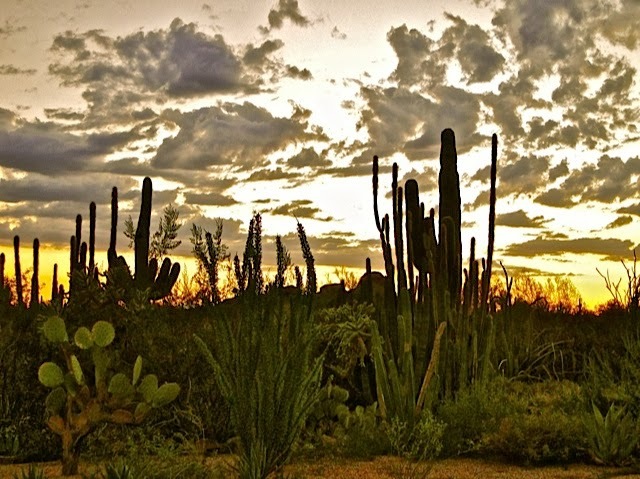 Sunset at the Desert Botanical Garden! On Saturday, that same day I photographed the cloud shaking it's fist (see Monday's post below) I also saw this huge cloud formation. It was later in the day as evidenced by the tint the low sun is giving these clouds. You would think with a cloud formation this big and full that we might have gotten some rain to go with it but, we didn't. Meet Stella! 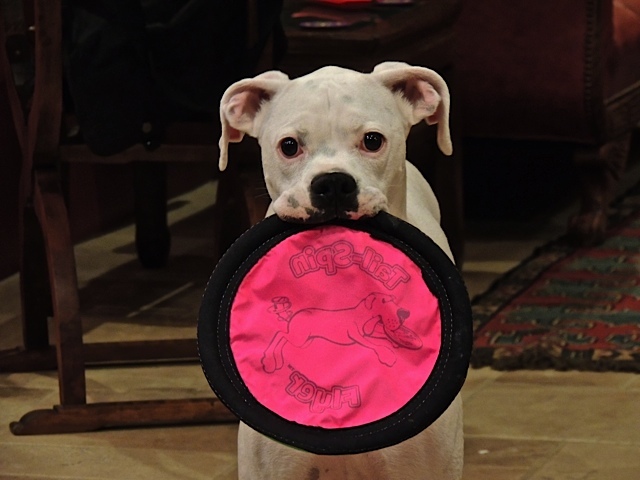 She is a white boxer and belongs to Julie's mom Glenda. Stella joined us for the dinner celebration I told you about yesterday. Stella likes to greet people with a toy in her mouth. She enjoys a good tug of war with this one. Stella really is a sweetheart. I have a new post up on Sharon's Sojourns. This time I visit an inland sea that is measured below sea level. My birthday and Julie's (Scottsdale Daily Photo) birthday happened last week just 4 days apart and to celebrate together we decided to cook dinner at Julie and Dave's (Tamarindo Costa Rica Daily Photo) house on Saturday evening. Julie picked the recipes from a cook book she bought in California. 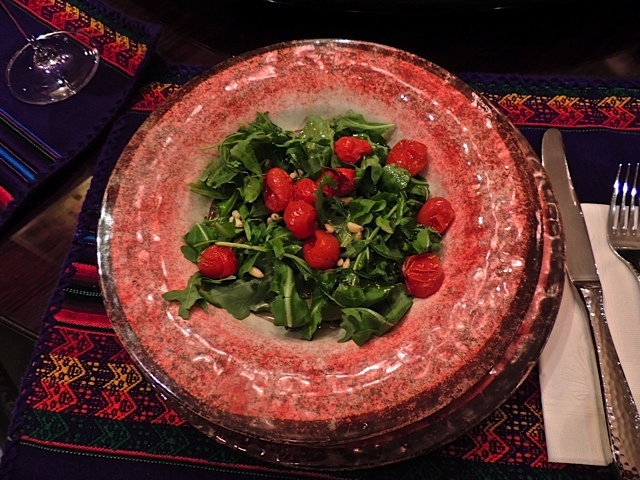 We started with an arugula salad with roasted cherry tomatoes and pine nuts. 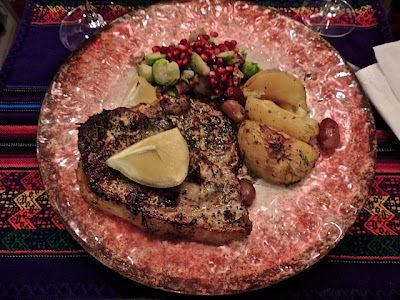 The main coarse was pork chops with fresh rosemary, oregano, garlic and lemon, served with roasted potatoes and red grapes and brussels sprouts with bacon and pomegranate seeds. 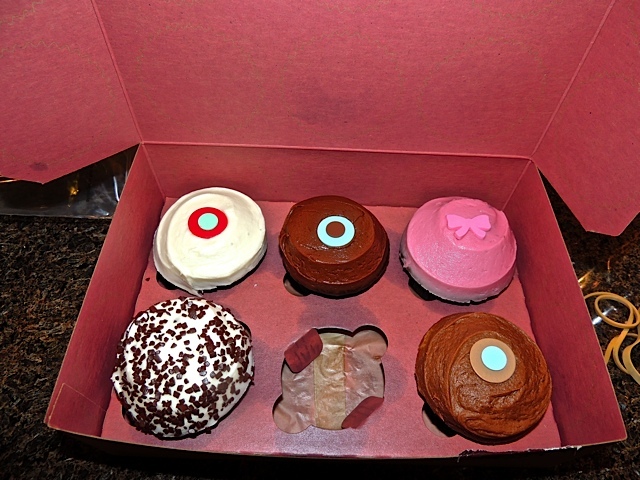 Julie's mom, Glenda supplied the dessert with these designer cupcakes that were delicious! It was a fun evening and a great celebration! ....don't be raising your fist at me Mr. Cloud! 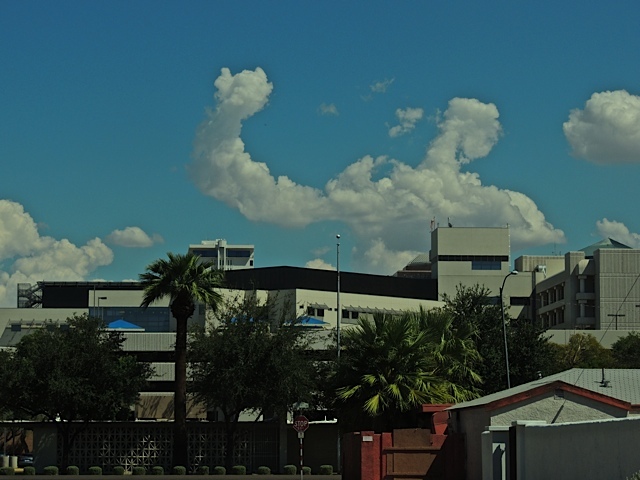 I was headed to the grocery store on Saturday when I spotted this big cloud shaking it's fist in the air. 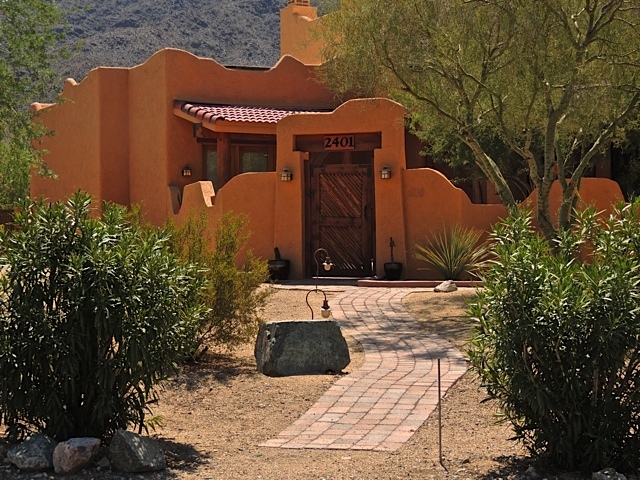 The slope of South Mountain was home to a real mix of housing structures from very large and luxurious homes to modest houses to the unique. 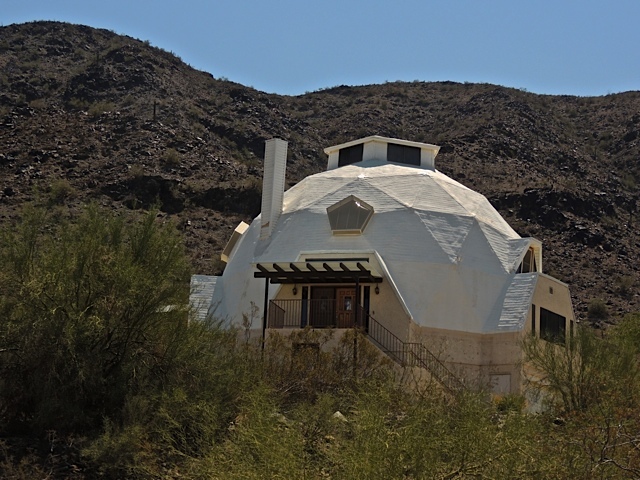 The geo-dome above is one of the unique ones. These types of houses are supposed to be environmentally friendly but, just between you and me, I don't find them very attractive. I also found this small but tall house. This one is certainly an unusual shape. It has a perfect location to take advantage of the views of the city but there don't seem to be any windows big enough to do that very well. I have a new photo up on Sharon's Sojourns today. Fashionable architecture is the subject this time. 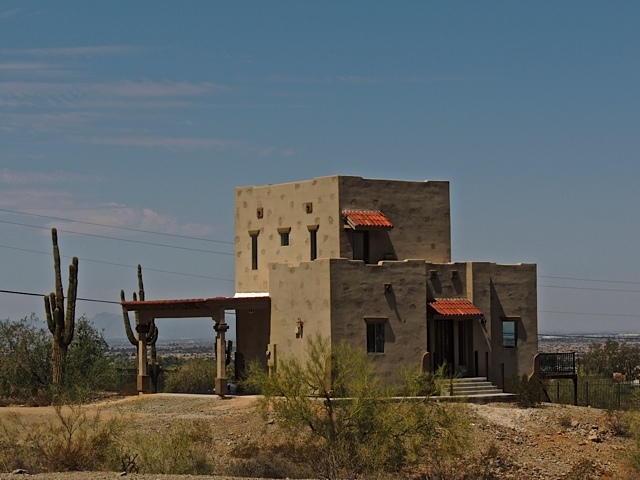 The South Mountain foothills also yielded some beautiful homes. This one is a very appealing southwestern style. There were also some unusual homes on the hillside. I'll show those tomorrow. Another interesting thing I found on the slopes of South Mountain was this saguaro cactus burdened with an abundance of arms. 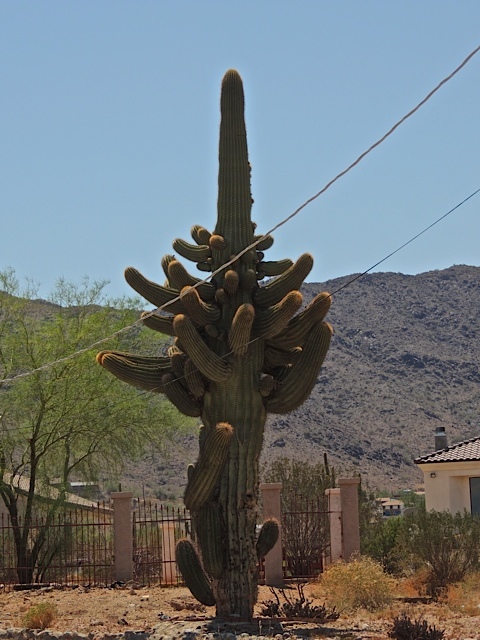 The cactus is located in someone's yard and there was no way for me to get a photo without those wires. So, it's not the prettiest shot but, at least I get to show you this oddity. Last Friday, before the rainy weather arrived I took a drive around the foothills of South Mountain on the southern edge of Phoenix. At one point I had this nice view of the downtown skyline through the haze and, I suspect, a fair amount of air pollution. It was a very hot day and when I zoomed in on this photo I could see a bit of that wavy heat distortion too. See that small white tiered building just left of the center of this photo? 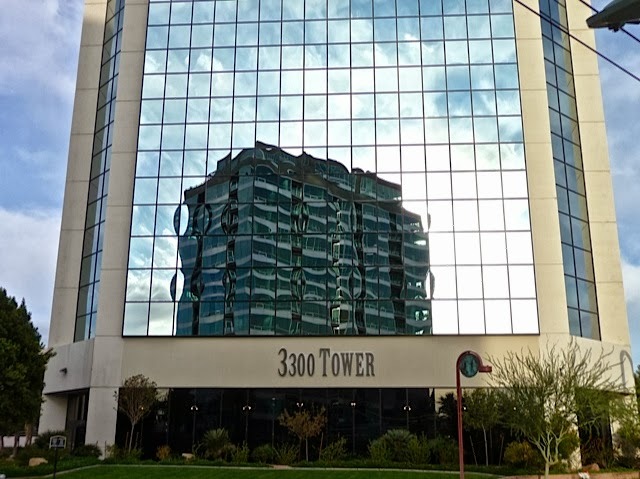 At one time in our history, that was one of the tallest buildings in downtown Phoenix. By the way, no more rain on Wednesday after all and now the temperatures are creeping back up into the triple digits. It was nice while it lasted. 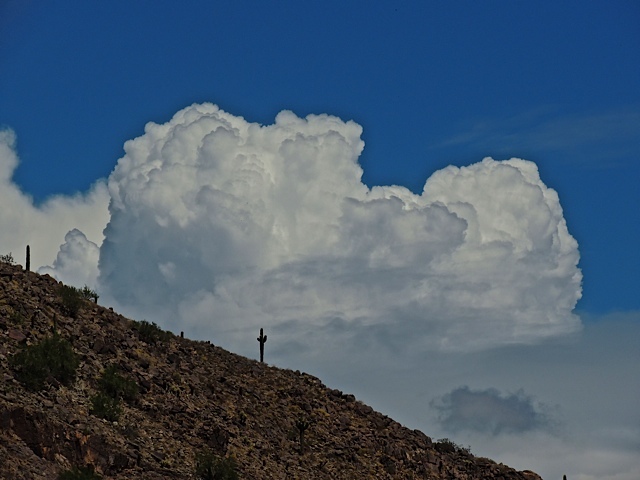 More monsoon clouds rolling in over the slope of Camelback Mountain silhouetting a saguaro cactus. It rained on and off all day Monday, there was light rain in parts of the valley on Tuesday and there is supposed to be more rain coming on Wednesday. Last night I sat on my patio for a while enjoying the cooler temperatures. Such a nice break from the heat of summer. On Sunday morning when I was watching it rain out my window I suddenly had the urge to take a walk at my favorite walking place the Desert Botanical Garden. I took my umbrella and headed out. 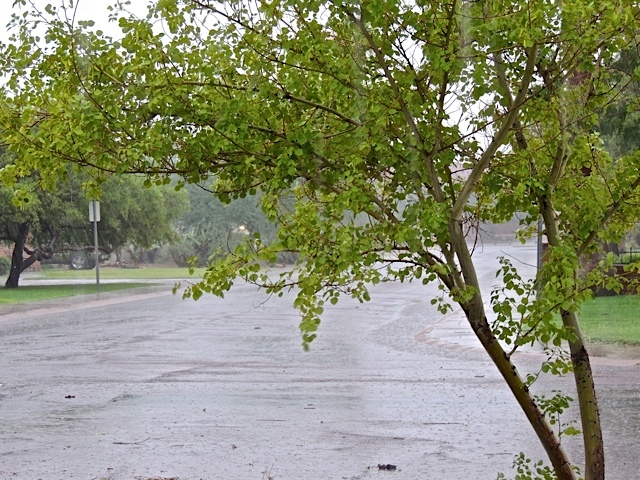 I really enjoyed that walk, the temperature was comfortable and the rain was a steady but, mostly a light sprinkle. 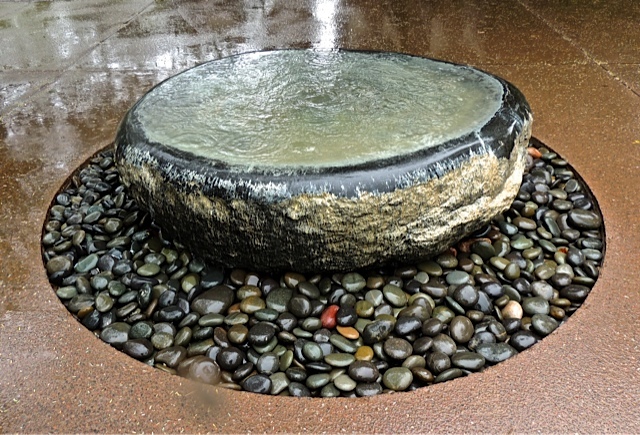 I even managed to take a few photos like this one of one of the garden fountains. I must admit, keeping the camera dry while taking photos and balancing an umbrella at the same time is a bit of a challenge. Thanks everyone for all the birthday wishes. I celebrated on Saturday with a wonderful dinner out with great friends. 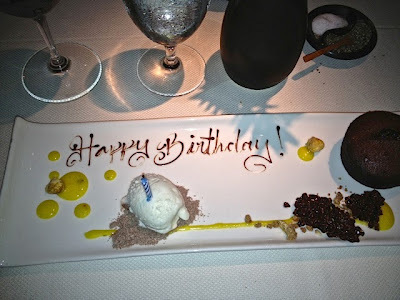 I thought I'd share a shot of my birthday dessert. It was a great evening of food, wine, and laughter. ....some serious rain. What a surprise on Sunday morning to wake up to rain and lots of it. It rained for several hours and the sky is still full of clouds. It's just what we needed. 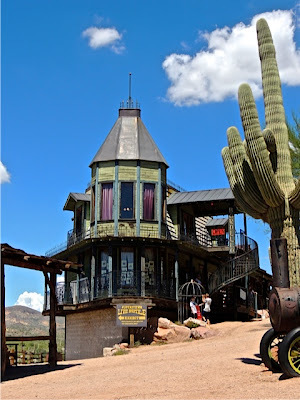 While I was in the Apache Junction area I decided to see if I could find the Mining Camp restaurant a place I've been to a few times but, not in a very long time. I was happy see it's still there; closed for the summer season but preparing to open in few weeks. 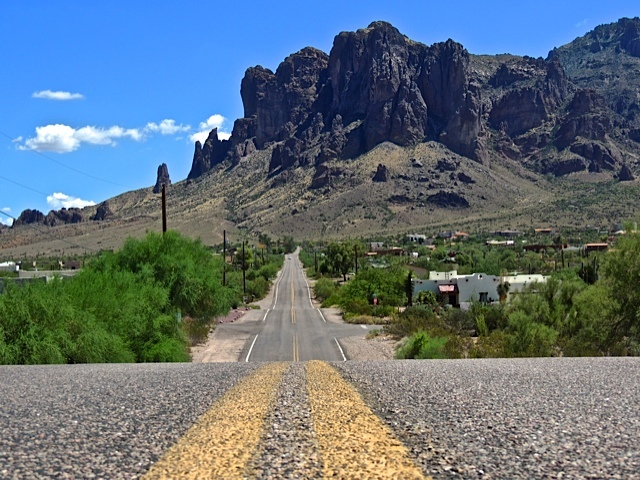 It's located close to the end of this road and very close to the base of the Superstition Mountains. 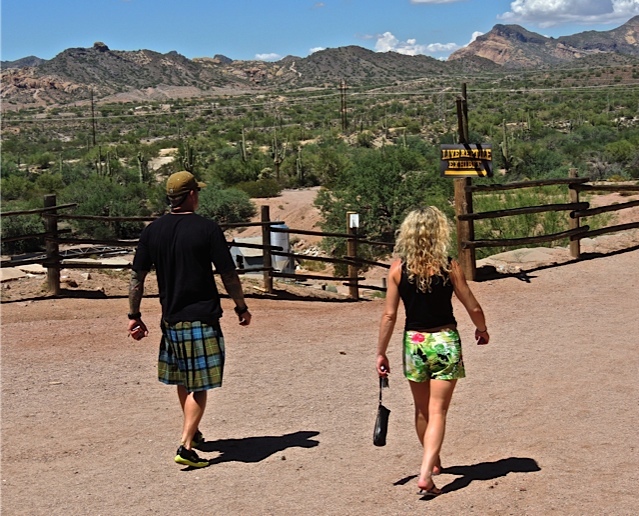 Those mountains are widely known for the old stories about the Lost Dutchman's Gold Mine never found to this day. The Mining Camp restaurant is one of those theme places where you dine in a huge mess hall just the way the old time miner's would, on tin plates and with tin cups. There is always lots of bar-b-que and baked beans and corn bread. It's one of those places where the food isn't memorable but the atmosphere is. It sure sits in a great setting perched right below those spectacular mountains. I have a new post on Sharon's Sojourns today. Two last shots from the Goldfield Ghost Town. 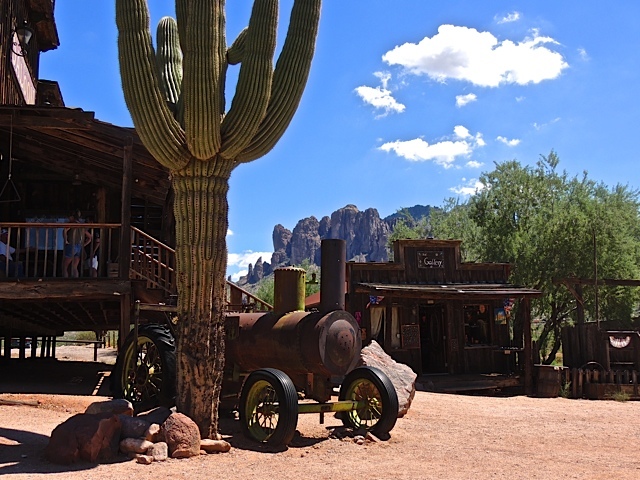 In the one above you get a glimpse of the Superstition Mountains in the background with that steam engine in the foreground. I notice that old engine has some brand new tires on it. 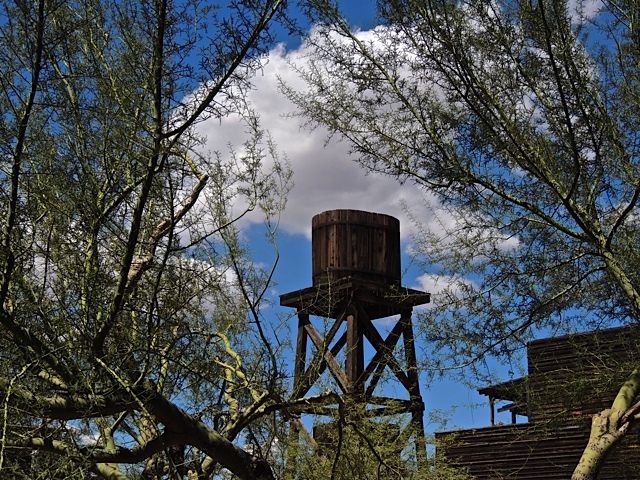 Below is a photo of the town's water tank captured between the branches of a palo verde tree. 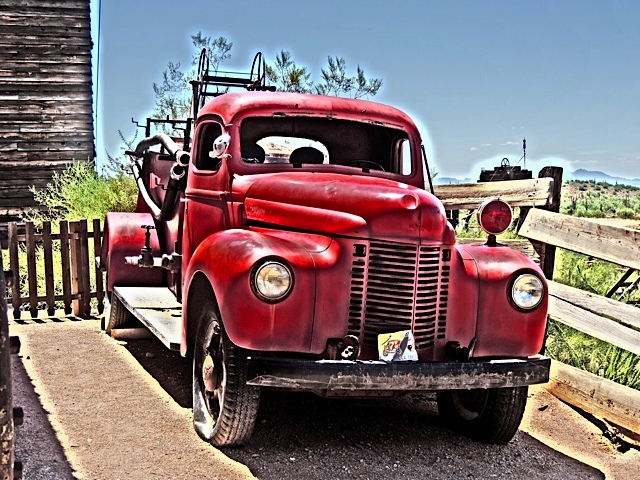 Hidden behind one of the buildings in the Goldfield Ghost Town was this bright red truck with the back decked out as a fire truck. I added the painting effect myself. I also noticed among the tourists enjoying the surroundings, this guy in the skirt....err....kilt. A truly interesting fashion statement for Arizona. ....here we have the town Bordello. The interesting thing about this place is that you can wander around and enjoy the old buildings at no charge. They do charge for the mine tours and the train rides but, I just wandered among the buildings enjoying the scenery. 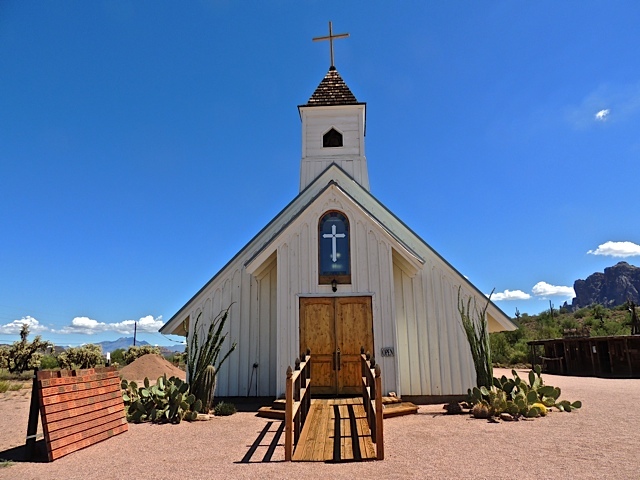 It was a Sunday when I visited and the little town church actually held a church service. 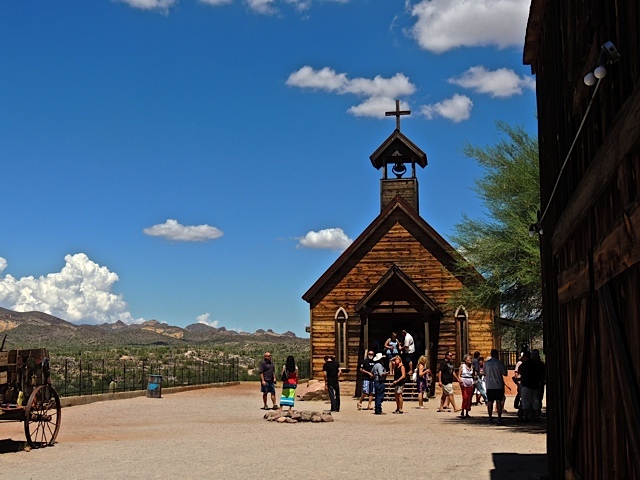 Here you can see the congregation gathering outside after the service. Tomorrow I'll show you a few more shots from this place. I tend to stay away from long highway trips on a holiday weekend so instead I looked for something a little closer to home to explore. 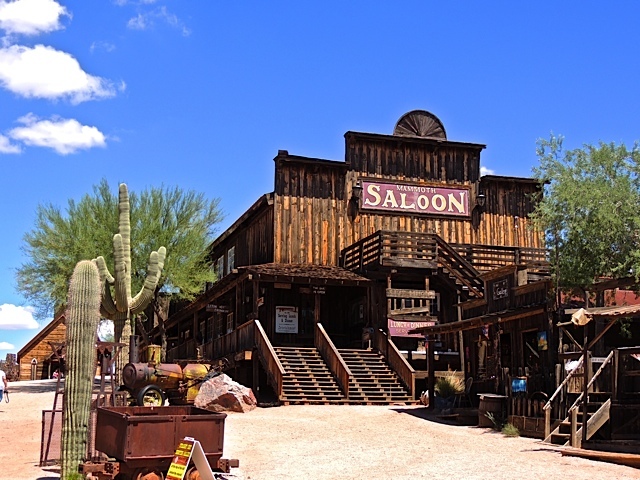 I found an interesting reference to a "ghost town" on my Arizona Atlas and it was located just on the edge of Apache Junction, a city on the very eastern edge of the collections of cities that make up the Phoenix metropolitan area or The Valley of the Sun as it is commonly known. So I headed in that direction and when I arrived in Apache Junction I found a museum I had never seen before. They have gathered up the remnants of an old movie set/tourist site called Apache Land, a very popular movie location from 1959 to 2004. 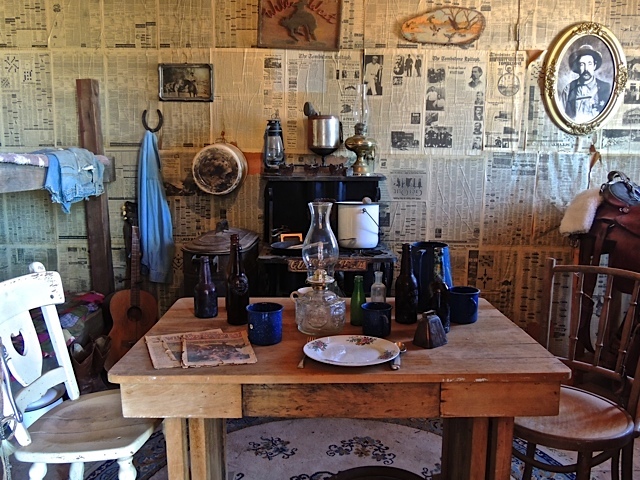 There were displays like the above depicting a vintage western cabin and there was a wall of photos of many of the famous movie stars who made movies at the old location. I enjoyed seeing those photos and reading some of the old newspaper coverage about the star's arrival in Arizona. This place was an unexpected surprise. On to the "ghost town" tomorrow. 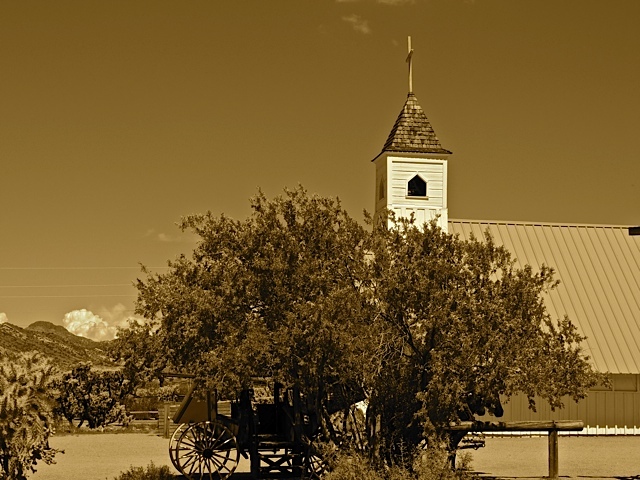 Stagecoach parked under the shade tree, country church in the background, looks like I've found the remnants of the old west. Tomorrow I'll show you where I found this scene. 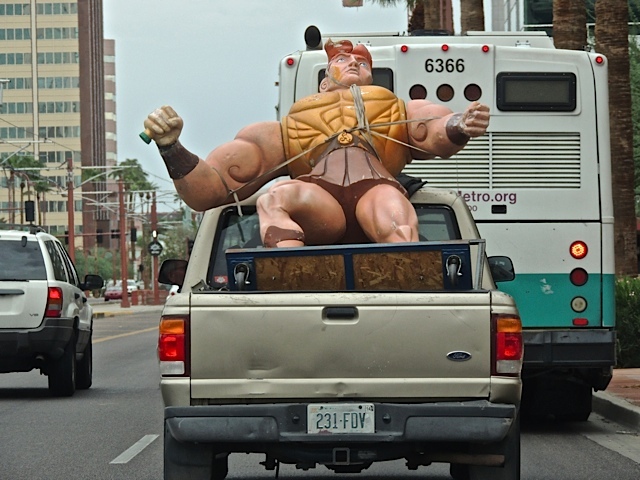 You can imagine my surprise when this truck-load of plastic muscle-bound masculinity passed me on Central Ave. I quickly grabbed my camera and followed behind the truck hoping for a chance at a shot. When that bus stopped at the curb stopping the cars behind, I had my opportunity and I took it. I wonder where he was going? Another first of the month has rolled around and it's time for another City Daily Photo theme day. 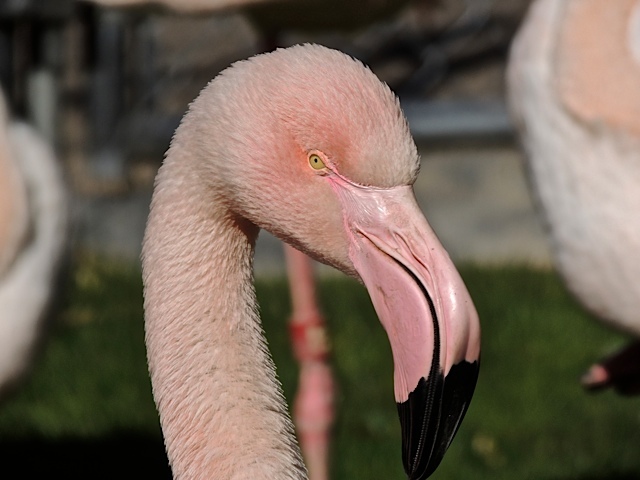 This months theme is "Pink" and I chose this pink flamingo that resides at the Phoenix Zoo. It was keeping its tiny little eye focused on me as I took its picture. You can click here to see how other City Daily Photo bloggers have depicted the subject "Pink".